Bring the Beauty of Sung Prayer into Your Church Each Sunday! Psallite is a new, one-of-a-kind music program inspired by the antiphons and psalms of the Roman Missal. The music of Psallite clearly reflects the role of liturgical music envisioned in the new General Instruction of the Roman Missal. It is music that restores psalm-singing as the primary prayer language. With songs that connect liturgy and life, church and home, the marvelous and memorable antiphons of Psallite transform your heart and your life. The songs are easy to learn, flexible and can be performed with or without instruments. The style of music is eclectic and, above all, very singable, providing powerful prayer resources for the liturgy, as well as the spiritual practice of lectio divina, praying the Scriptures. Most importantly, the beautiful music of Psallite allows the whole congregation, cantors, and choir members to sing the Mass instead of simply singing at Mass.
" . . . the collection is deeply pastoral in the models it provides for music to open/close the celebration, to proclaim God's Word, and to draw communicants to/from holy communion." "Psallite makes a needed contribution to the music liturgy. 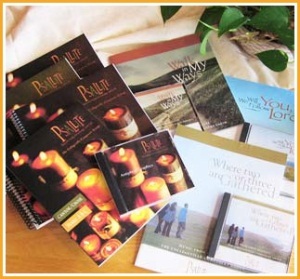 A ‘must have’ resource for those responsible for music in the Church."